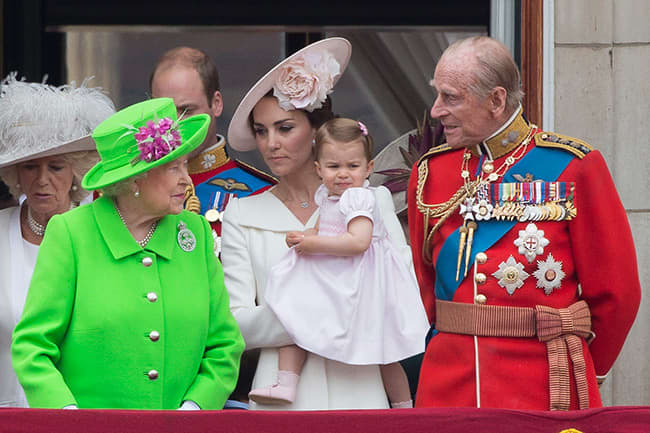 These royals might have inspired Princess Charlotte's cute pink dress | HELLO! Princess Charlotte stole the show with her appearance on the Buckingham Palace balcony at Trooping the Colour on Saturday. Dressed head-to-toe in pink, the 13-month-old looked adorable as ever, but the designer of her pretty dress remains a mystery. 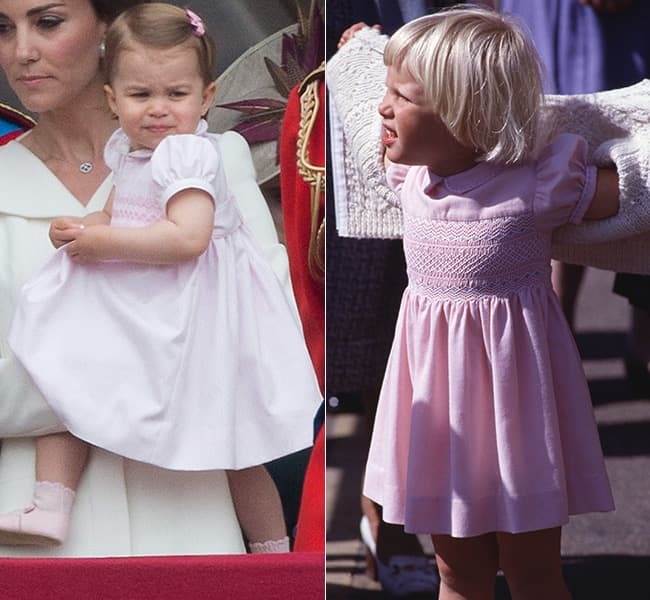 Royal fans have been working hard to identify the traditional pale pink dress, with some speculating that just like her brother Prince George, the outfit Charlotte was wearing may have been handed down from another member of the royal family. 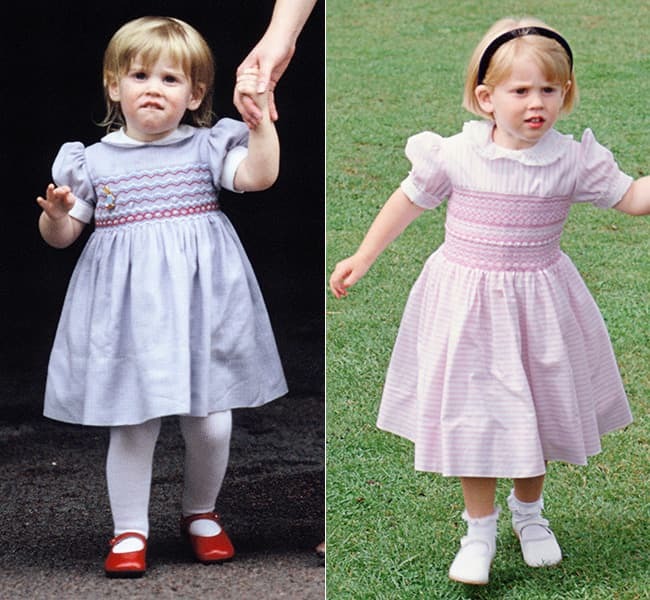 Some have noticed that the dress is remarkably similar to one worn by a young Zara Phillips in 1984, when she was three-years-old. However while there are a number of similarities between the dresses, it is unlikely that Charlotte is wearing the same dress as Zara. While they both have peter pan collars and smocking detail, Zara's has additional blue embroidery and is likely to be far too big for Charlotte, who is only 13-months-old. Instead it appears that the Duke and Duchess of Cambridge have taken inspiration from the traditional summer dresses worn by young members of the royal family over the years. Prince William's cousins Princess Beatrice and Princess Eugenie both wore similar frocks with Mary Jane shoes when they were children, and now it appears the next generation of royals will follow in their footsteps with timeless and traditional outfits. Princess Charlotte wouldn't be the first member of the family to wear a royal hand-me-down; her brother Prince George has been dressed in outfits previously worn by his father for the last two Trooping the Colour ceremonies. On Saturday the young Prince, who turns three in July, wore the same white shirt and blue shorts that William had initially worn for Prince Harry's christening some 32 years ago.